381' by 33'10" by 15'4"
Refitted in early 1942 with improved engines, fire control, air condition, and two exterior stern torpedo tubes with reloads. Minelaying gear was removed in mid-1942 to make room for the Makin raiding party. The mine stowage and handling compartment was fitted with accommodations for about 120 men and the boat was reclasified as an APS, transport submarine. 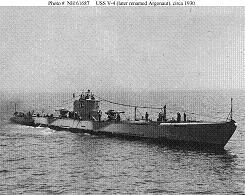 The Argonaut was completed in 1928 as part of the V program, and was originally designated as V-4. She was a specialized minelaying submarine, the only such ever constructed by the U.S. Navy. She was very large, in order to increase her reserve buoyancy, and therefore unusually habitable for a submarine. She cost an astounding (for that time) $6,150,000 to complete. Her minelaying gear was highly complex and sophisticated, with mechanisms to automatically flood special trim tanks to keep the submarine on an even keel as each mine was released. However, the minelaying gear was difficult to operate, and she was slow and not very maneuverable and took seemingly forever to dive. She was lost off New Britain on 10 January 1943 to a depth charge attack that was witnessed by American aircraft. Fife's decision to send this clumsy and ancient vessel on a war patrol remains controversial.